Of the cordillera of Baxs seven symphonies the sixth is the undoubted peak. Including this one there have been only three commercial recordings: Norman Del Mars Lyrita from 1965 never transferred to CD and Bryden Thomsons. Del Mars still stunning account remains un-available and would be a strong contender despite its vintage and the oddly spot-lit recording. The Thomson on Chandos is a modern recording but is afflicted with a strange lassitude. Baxs symphonies tempt a certain Delian meandering but benefit from a strong forward pulse even in the most lyrical moments. Bostock (a Thomson pupil) captures the spirit of fantasy and adventure so well in an account drenched in a potent blend of magic and violence. He does not allow proceedings to descend into an invertebrate dream but injects a sense of urgency and conflict and keeps things moving. He is clearly sensitive also to Baxs love affair with beauty just out of reach and suggests this in the sense of joy lost and a peaceful but enchanted resignation of the closing pages. Tintagel is given the best performance I have heard bar only the original Eugene Goossens set of 78s from the 1920s. Bostock and his German orchestra are concentrated and passionate projecting a sea-spattered and urgently romantic canvas. This vies only with the early Decca Boult recording and is of course a much better recording than the Decca. Lastly we have a recording premiere in the brightly swashbuckling Overture to Adventure written for Dan Godfreys successor at Bournemouth, Richard Austin. The orchestra is enthusiastic and accomplished lacking only the last ounce of sumptuous tone in the strings by comparison with Del Mars mid-sixties Philharmonia. The overture is in the spirit of many British overtures of the 1930s and 1940s having something in common with Moerans ENSA-commissioned Overture to a Masque. Fine recording. Good notes though anonymous. A very strong cross-section and a recommended collection featuring the key masterwork in the Bax output. Confidently recommended. Bax is both an interesting and important composer. He may not be a great composer and his music does lack rhythmic invention and yet contains an equalled atmosphere. He has often been called the composer of 'music of Celtic twilight' whereas his music also inhabits the world of glowing sunlight. His orchestration often shows a delicate palette and yet he can produce moments of controlled pageantry. The Symphony No 6, which dates from 1934, is a very likeable piece, although, possibly, a little overlong, and this performance is warmly recommended. It brings out clearly the shifting tonalities, the wonderful harmonies and the clear textures indicating that Bax was a fine orchestrator. His symphonies are rarely performed and so we are grateful that this loving account is available. Bax often employed a worrying sense of form or structure. There is far more satisfaction in movements being complete and separate entities in themselves. In this symphony, the finalé consists of four elements - an introduction, a scherzo, a trio and an epilogue and, to my mind it does not work. There is a quality to Bax's music which is easy to admire yet hard to define. It has a very human face, a warmth and tenderness that is devoid of sickliness. His use of the woodwind is exemplary. Douglas Bostock understands this beautiful score and the playing he secures from the Munich Symphony Orchestra is admirable. The sound and balance is very good as well. The performance of Tintagel serves to remind me of how similar this score is to Debussy's La Mer completed over a decade earlier. This performance is lacking in the drama and excitement that exists in both the Boult and Thomson versions but there is much orchestral detail to admire. 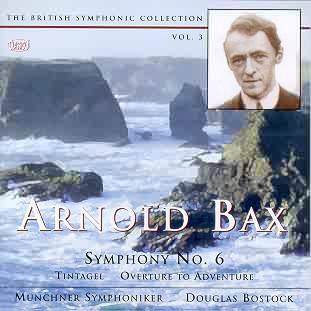 The Overture to an Adventure was performed early in 1937 and, among other things, includes an introspective melody for the strings which may qualify Bax to be a 'late romantic'. The music 'stops and starts' which is a weakness inherent in some composers and undermines any work's sense of continuity or momentum. This is more a tone poem in the Sibelius mode than an overture but in this genre, Bax is no Sibelius! The disc should please many. The Del Mar reading of the Sixth Symphony is in many ways preferable and Tintagel is far more expressive elsewhere. But there is much to admire in this recording.